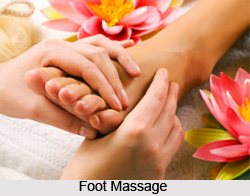 I am able to offer a tailored Aromatherapy massage for the lower legs and feet as an optional add on. I am qualified to blend from 13 specified essential oils that can treat conditions of the feet such as: Arthritis/Gout, Athletes Foot, Bunions, Chillblains, poor Circulation, Cramp, Foot Odour problems, Dry/Cracked skin, Fluid Retention (Oedema), Sprains, Veruccae/Warts. The oils will be blended at the appointment to address the specific issue. You don’t have to have anything ‘wrong’ with your feet to enjoy the relaxation/energising benefits of the oils! This is a lovely and effective way to round off a Reflexology session, as it enhances the relaxation process, plus the therapeutic benefits of the essential oils are the added bonus.